Connect with your family in this Solar Log Cabin – as a retreat, rent it out by the weekend, live here full time (great schools) – or just as a getaway – you gotta see this place! Hiker’s, Writer’s, Artist, Nature Lover’s paradise! VIDEO of Artist Retreat, LOG CABIN, 42 acres, LIVE WATER, Stream, Tiny House. YOU ARE 1st to SEE this PROPERTY! 🙂 Here is another AMAZING property we just got to sell for a family who’s had this property for decades. Just 15 minutes to College Town = Danville, shopping, movies, Performing Art Center, restaurants. The sellers have had this property for decades and have now called us to find them the perfect buyer. It is like being in the Smoky Mountains – probably the quietest place I’ve ever been to. 1 mile to the Central Kentucky Wildlife Refuge! Amazing. This cabin is NOT for everyone – it currently has no ‘real’ running water – there is a tank and a sink and it works. Lights are Solar / LED / battery / inverter – yup, they work just fine. Two-seater outhouse 🙂 You can EASILY put in a solar incinerating toilet for about $1800. and they work! Here’s a video of how incinerating toilets work – VIDEO of incinerating toilet here Or a full bath with septic system – how far do you want to take it? This cabin is perfect exactly as it is, or take it to the next level. It is like a Tiny House that are all the rage now – but so much nicer. It has 1 bedroom with 3 beds, pullout couch (easily sleeps 6), an outhouse bathroom – and plenty of room to put in a real bathroom, an open floor plan with 720± square feet of living space. Best of all, it’s tucked away – WAY out of the way – off the beaten path — kids and grandkids will love it! Priced at only 150k, it should move very quickly. If you or anyone you know is interested in seeing this property, please let me know. 859-494-5521 Ken – that’s my cell, you can call or text. You are the FIRST to see this – images will go up today on http://BluegrassTeam.com — and the short VIDEO will be done in a couple days or so – this type of property is what people want – Cabin, 42 wooded acres, huge deck overlooking the stream, metal roof, lots of PRIVACY, views out of this world, etc, etc How about you? Call me this week – if you (or anyone you know) have any interest, please let me know – VERY impressive property – you will LOVE it! 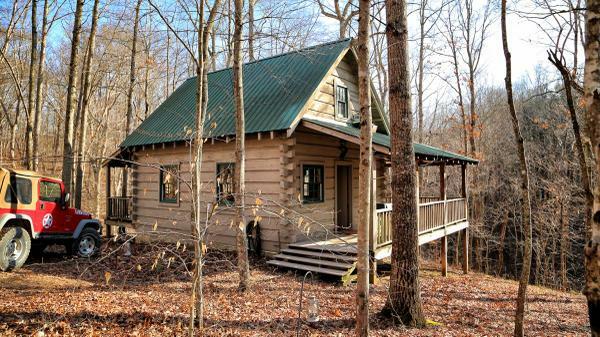 Tweet this out: Solar Log Cabin on 42 wooded acres with Stream – Artist Retreat for sale in Kentucky – by the Tar Lick stream. 4. It has a big woodstove!